The Renaissance concept of the ideal city is expressed by Leonardo in his rigorously geometric urban planning. 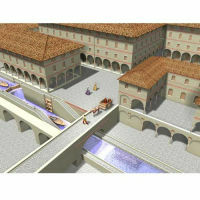 His ideal city is characterised by the perfect integration of a network of canals, which are used both for commercial purposes as well as a sewage system. Leonardo conceived of buildings as hydraulic machines which distributed water in all the rooms of the house as well as in the artisan workshops through a mechanical lifting system. In the workshops the energy released in this way was used to drive various types of machines. The ideal city, therefore, was organised in a functional way and Leonardo describes, in Manuscript B in particular, some of the buildings and its mechanisms. Leonardo notes that carriages and other means of transport will travel only on the low level, gentlemen only on the upper level and “foetid things” only on the underground level. On folio 37v he describes the lock system. This allows boats to be lowered to the underground level and continue their journey under the buildings.